12.5" RCOS @ ~f/9 (2880 mm fl) 0.64 arcsec / pixel. The Zoomify image scale is 0.85 to 3.33 arcsec / pixel. No SDSS stars were available for color balancing, so a standard image-train color calibration was used, as determined by eXcalibrator v3.1, and then adjusted for altitude extinction. CCDBand-Aid version 1.0 to repair STL-11000M vertical bars. PhotoShop for none-linear stretching, LRGB combine and adding Ha data to the red channel..
NGC 6822, Barnard's Galaxy, was discovered by Edward Barnard in 1881. At a distance of only 1.6 million light-years, towards the constellation Sagittarius, NGC 6822 is a member of our Local Group of Galaxies. 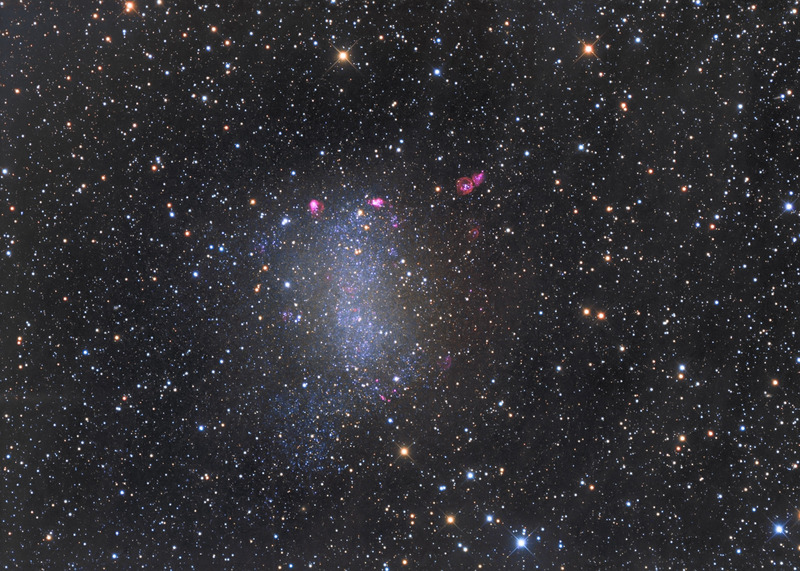 From our vantage point, the irregular dwarf galaxy appears nearly rectangular. Surrounding the galaxy are several red HII regions also know as emission nebula.